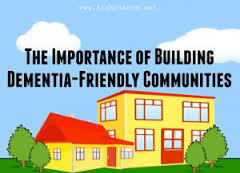 I’ve been thinking about Michelle’s ideas, inviting us all to be part of creating a more-dementia friendly community. Here are additional thoughts from Michelle Niedens, L.S.C.S.W. Director of Education, Programs and Public Policy, at the Alzheimer’s Association’s Heart of America Chapter. What volunteers would walk with their neighbors who were living with Alzheimer’s disease, so they could exercise and visit with others, without worrying about getting lost? What if neighbors volunteered to visit regularly or run an errand? What if law enforcement went beyond Silver Alerts and had standardized protocol for individuals who wander and go missing? What if gas stations and convenience stores had training to recognize someone who might be lost? What if pharmacies provided support information any time an Alzheimer’s drug was prescribed? What if doctor’s offices had “memory aware” time slots, so people living with dementia wouldn’t have to wait in a noisy, chaotic environment? What if there were geriatric urgent care settings? What if grocery stores had a “slow down” line? What if grocery stores had designated times when shopping support was available? What would it take for all of us to be “memory aware” and to act on that? I want to do something to help here in Kansas City, but I haven’t yet decided what. In my upcoming book, Staying Connected in the Land of Dementia, I write about Meet Me at the Movies & Make Memories, a movie-going event for those living with dementia and their partners, co-created by John Zeisel. That really appeals to me and I’m thinking about contacting local theater owners. I welcome collaborators and I also would love to hear your ideas. What actions are you inspired to take?